Government action is essential to agricultural growth that would combat poverty in Africa, experts say. Alliance for a Green Revolution in Africa’s annual report, released Wednesday, discusses previous successes and looks to the future. 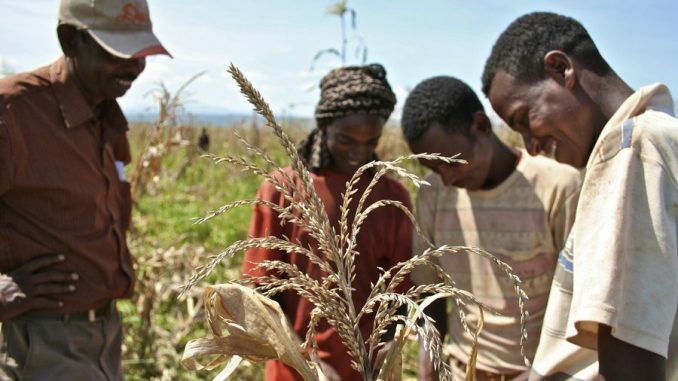 African nations will struggle to grow their economies and combat poverty unless they tie high-level political will to government action to help farmers, agricultural experts said in Rwanda on Wednesday. Successfully using agriculture to push broader economic growth – as many nations in Asia have done – shows political support is “more important than seeds, weather, and soil,” they added. “There is no economy in the world that has grown without its foundation rooted in agriculture as the engine,” said Boaz Keizire, head of policy and advocacy at the Alliance for a Green Revolution in Africa (AGRA), a nonprofit. “Even the United States of America, China, and all the Asian Tigers … started with having a robust agricultural transformation and agricultural-led industrialisation,” Mr. Keizire told the Thomson Reuters Foundation. Opponents have criticized leaders of both countries for running what they describe as authoritarian states, raising questions about whether agricultural transformation might be more effective under strongman leaders. Paul Kagame has been Rwanda’s president for 18 years, while Ethiopia has only this year begun releasing long-held political prisoners as part of a national reconciliation effort. Keizire, one of the report’s authors, said agricultural success in African nations required political energy, targeted policy reforms, government capacity, and an enabling environment for agribusiness. And he warned that failure to build public support for agriculture’s potential would delay the continent’s agricultural transformation by decades – or see it never realized. In Rwamuzenga Mashland, which lies 87 miles south of the capital, about 4,000 smallholder farmers in a local cooperative have successfully grown maize on a more than 500-hectare stretch of wetland by planting sweet potatoes on the edges of raised soil beds to prevent erosion. And it noted that political momentum and government capabilities for backing agricultural transformation were improving in countries such as Kenya, Burkina Faso, Mali, and Zambia. In Kenya, for example, President Uhuru Kenyatta’s government is focused on four development pillars – manufacturing, food security, universal health care, and affordable housing. It has allocated about 20 billion Kenyan shillings ($200 million) to boost food security and nutrition by 2022, said Henry Rotich, cabinet secretary for Kenya’s treasury. A further $24 million will support manufacturing programs, including some that would add value to agricultural products. Meanwhile, Ghana’s President Nana Akufo-Addo’s government is promoting agriculture transformation through a “Planting for Food and Jobs” campaign. David Phiri, the sub-regional coordinator for Eastern Africa for the UN’s Food and Agriculture Organization, said the continent could still produce enough food despite a rising population and a changing climate. And, he added, the continent would see life improve for many of its small-scale farmers if governments simply acted on more of the agreements that they signed.”Signing an agreement is one thing. But implementing the same is another,” he said.